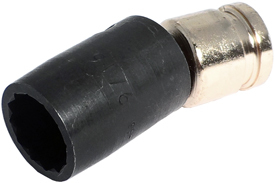 Omega Technologies 3/8'' square drive low profile swivel 12 point socket. Using OMEGA swivel sockets prevents the compromising of joint integrity while providing enough torque to the fastener. Please note that these are not intended for use with impact tools. The OMEGA USD375-56 9/16'' Low Profile Swivel Socket, 12-Point, 3/8'' Square Drive is one of thousands of quality tooling products available from MRO Tools. Please browse 3/8'' Square Drive Swivel Sockets for tools similar to the OMEGA USD375-56 9/16'' Low Profile Swivel Socket, 12-Point, 3/8'' Square Drive. OMEGA USD375-56 9/16'' Low Profile Swivel Socket, 12-Point, 3/8'' Square Drive description summary: OMEGA TECHNOLOGIES 9/16'' 12-point low profile swivel socket, 3/8'' square drive. Opening Size: 9/16'' Length: 2.106 Diameter: 0.850 Nose: 0.800 Quantity discounts may be available for the OMEGA USD375-56 9/16'' Low Profile Swivel Socket, 12-Point, 3/8'' Square Drive. Please contact MRO Tools for details.